2002 Fleetwood Revolution J60452--Want to install larger TV in front of Bedroom Window. How far/deep can you attach fastener to walls or ceiling safely..not sure I can find stud. Your current TV is probably mounted to a 2" X 4" in wall. To make sure, give a call to Fleetwood Tech Dept. have your VIN# and FIN# handy. Your FIN# should be on a little plaque, outside below DR window! What is J60452? The following website has generic information on MH construction at the factory. I found it doing a simply internet search. MHs are built to HUD standards. 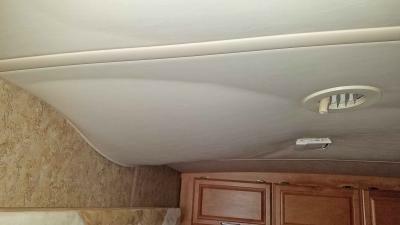 You may be able to get specific information from an owner that had this issue, Fleetwood, or an RV upgrader. One way to do this is talk to several RV upgraders, tell them what you want, and ask them to bid for the work. You can also ask them to explain how they would do the work, then consider your options including doing it yourself. There may be electrical wires in the wall, insulation, etc. to deal with. I would read through all the comments then upload a question to the author. At the rental dealership I worked at the basic idea was to just "Kick and rip the crap out of everything." Be bold. All of which may or may not apply to your particular year and model....to be safe and avoid doing something to your electric or plumbing, I again urge you to call Fleetwood Tech and make sure! Thanks everyone. Calling Fleetwood and giving them the last 6 digits of VIN # probably best option and getting bids from someone that knows what they are doing. Thanks again, first RV & Love It. Come on Carl Play nice. Roger you too. Both of you have plenty to offer. As you communicate your points of view, reread as though you were the recipients and how you would like to be addressed/treated or corresponded with. Leave the attitude out of it. Proof of your pie is in your pudding. Be patient and thoughtful good advise for me too. Studs in my "OLD" coach 1999 might be 0n 16 inch centers I know the floor framing is it is also thin wall aluminum. I also know they are 1 1/2 inches deep with no more than max paneling 3/16 thick inside. Floor is 3/8 thick top and 3/16 max underside in the basement. That is something to check by golly. Hi Just joined as a member, looking to see if anybody has had their ceiling(vinyl) falling down. Foam is disintegrating and coming unglued. Looking for fixes! Do you know what causes the damage-- also looks like naked OSB on the upper walls??? Two fixes I now are to cut/strip it all out and start over-- a MAJOR JOB. Or install more battens to hold it up. Wouldn't hurt to e-mail these pictures to your coach maker and ask for their suggestion. Bulges on the ceiling of this nature are almost always caused from a leak or leaks of the roof, back when they used ceiling carpet, was easy to spot, most now are vinyl covered foam backing, and the foam usually soaks the water and becomes heavy causing the material to pull away from the ceiling substrate. I would start by checking for possible leaks on the roof, around the AC units, seams, anything penetrating the roof can easily be resealed, and also look for possibilities of damage. Most of the battens on your style ceiling are a molding cover that snaps into place over a metal backer which is screwed into place. Of course a call to the manufacturer can verify this. If it is as described, the vinyl can be lowered carefully, being careful to not pull any that is attached now, then you can buy spray contact adhesive made for automotive purposes at most auto parts stores. Be sure to follow the instructions on the can. I believe that the upper is just wall paper, or wallboard with covering that resembles OSB. Sorry for my miscue, the first picture looked like the upper walls were OSB (Oriented Strand Board). Let us know what the manufacturer recommends. What is hanging in the AC vents? rv2dan, what make and year coach are we looking at? Brett, at first I also thought like you. Kay. Agree with approach...in any event it''s not a small job. Got to find the cause. Wall paper that looks like OSB? Now that is a new one on me. The next time I have the opportunity to tour a MH plant, I want to see when they install the ceiling panels. If i understand it the ceiling panels are finished, installed and then the cabinets go in. However in the pictures it looks as if the panels covering stops just past the cabinet. (see exposed fabric edge). rv2Dan, there are several things I would do. First would be a call to the manufacture of you coach. (listing the make, model & year helps with inquiries) See if they might have a solution. Then I would find a possible web site on your make and model to see if others may have had the same problem. I would also determine if it was caused by moisture penetration or faulty manufacturing. What part of coach is the first picture from? Herman, I'm still having trouble deciding on wall paper or OSB, when I look at it again??? The vinyl ceiling in our coach was also hanging down. The thin foam rubber above the vinyl had disintegrated and the glue on it had also let go. We were fortunate in that there is a six inch wide vinyl covered strip running from front to back in the coach. I took the strip down, took it apart, installed new foam & glue on the luan board, then tackled the ceiling vinyl. I removed hundreds of staples that were hidden under the ceiling covered strip, pulled the vinyl towards center, after getting what decomposed glue and foam out, and then restapled the vinyl. I then added about 36 snap/covered buttons spaced about 12" apart in rows front to back. Replaced the now reconditioned center strip and ceiling looked like it was supposed to. But what a job!! Sore arms & shoulders working overhead. Sticky glue & foam seemed to go everywhere! No one ever seems to notice these additions as they ARE additions to the existing snap/covered buttons. The "buttons" have a wood screw in the center and work very well. Why not try to locate some compatible buttons for your ceiling, pull the ceiling over to the cabinets, staple in place, and then add a cover strip along the wall to hide the staples? Herman, pictures are deceiving, I only meant that the picture makes it look like OSB, not that it was made in the fashion of OSB. Nitehawk, good observation, I do not see any buttons in the OP pictures, but they can certainly be added. Back in the day of ceiling carpet, I used a large hypodermic needle to inject the contact glue through the fabric to help adhere the carpet into place. One could predetermine the placement of the buttons and use the needle glue for extra support. I used the same needle that is used for vitamin B12 injection, as they are of a pretty large gauge. OPs question reminded me of a funny story when I wanted to install a TV on my first RV. It was a 70's something 20' or so. This RV didn't have a TV or even a microwave. Anyway, I bought a small 13' TV, mounting bracket and required wood screws. All set to go, located where I wanted the mounting bracket and screwed it into the wall. All good........tested the mount by pulling on it a few times, then installed the TV. Plugged it in and it worked! I was really proud of myself until I went outside and saw them dang wood screws sticking out of the aluminum siding on the trailer........hahaha . So, I undid everything, found shorter screws, relocated the bracket a few inches.......then used silicone to seal the bad holes. Yup, there were 2" x 4" studs all right. They were just oriented flat instead of like a traditional stick house. Had I thought about it enough I could have saved the expense of a tube of silicone! I cant remember the brand of that trailer anymore but sure remember the story like it was yesterday! 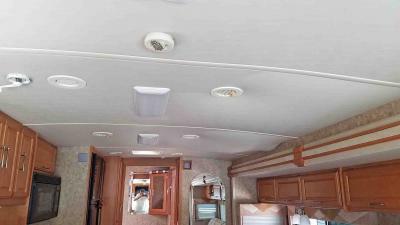 Most newer coaches do not use wood studs anymore, not true with 70% of travel trailers. Most newer coaches actually use steel, some of them use aluminum framing all welded together and foamboard placed between this framing with lauan plywood inside and out, the newest of which use a composition board which will not delaminate, this is why the newest coaches you don't see as much delamination of the fiberglass skin. The builders still place a wood 2X6 just under the roof line and around the exterior doors for easy attachment of the awning j-rail, and entry lights. This is a reason why it is best to consult with the builder if possible before attaching anything to the walls. Also be aware that many builders use the framing like conduit to channel wiring to the many locations throughout the coach, this why it is not a good idea to use a stud finder to locate the studs and to drill into them without knowledge of what is inside of them. If your motorhome was built after about 1980, please do not assume that the manufacture even resembles the manufactured home example as indicated in an earlier post on this same thread. Motorhomes are not built to HUD standards, they are built to RVIA standards. I worked in the manufactured home industry for 5 years in late 70's, and early 80's, and am very familiar to all stated in that article. Have visited several coach manufacturing facilities, and know there is no comparison. What tells me it's wall paper are the trim strips that cover the seams. Champion Motor Homes were built in Van Alstyne Texas in the mid 70's. It was the typical square box build. To my knowledge it was one of the first coaches to use 2x2 square tubing. They layed out the exterior panels, layed the welded wall studs in place then sprayed foam insulation on the inside of the wall. The studs had two sides tape to hold the panels to them before foaming. Turned it over and routed out for the openings. When all was done the side panels were only held in place with tape, foam and a few screws. We've come a long way. Herman, Champion is who I worked for as mill and cabinet forman for back then, not in the motorhome end, but in the manufactured home at that time. I did go to a facility in Texas while in their employ to help build new jigs. The spray foam was used in all their plants at that time, the foam was to make a very good bond of the exterior panels to the frame, the two sided tape actually held the interior panels in place while staples were shot into wood strips placed between the metal tubes, no way to foam the interior panels. "Good old days" HA-HA. Yes we've come a long way. Back then that was considered real progress. However by today's standards they were just plain ugly. But then again I can remember when Duck Tails were considered the cats meow. Today they would be called a really bad hair day. Did I just write that? Really, really telling my age now. Duck tails? Is that the same as a mullet? Duck Tails = 50's Remember Fonzie, "hea!" Mullet =70's, Elvis, "Thank you, thank you very much"